A complete point cloud software. Classify your objects 3x faster and focus on the most important aspects of your projects, in just a few steps. Maximize your budget with a complete software. VisionLidar easily replaces more than 4 traditional solutions. 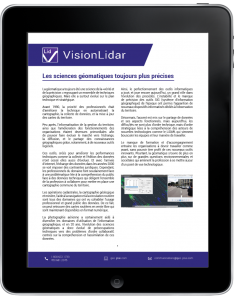 Get the most out of your investment after only 3 months of usage thanks to the efficient workflow VisionLidar provides. VisionLidar 365 securely shares your point cloud and 360-degree images from your server. It’s now possible to visualize, process, classify, segment, animate, and edit Point Clouds in one single software : VisionLiDAR. 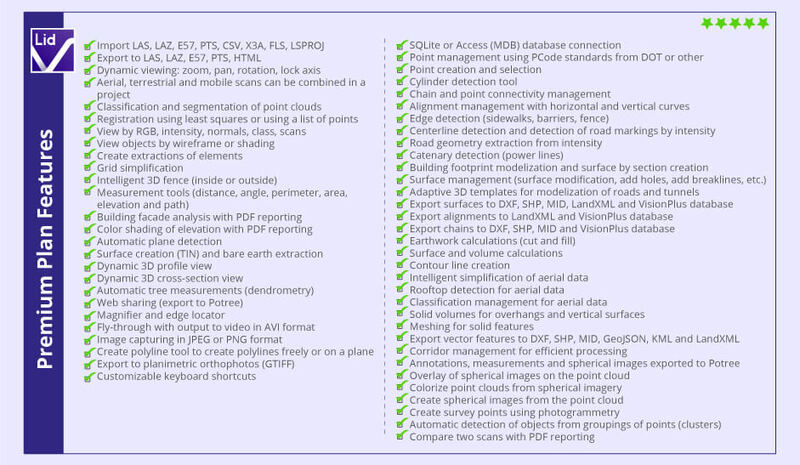 No more restriction based on a maximum number of points; VisionLiDAR can read and process an infinite number of points to allow you to work with your massive Point Clouds in one single file. Process Point Clouds from ALS, TLS, and MLS for all your civil engineering, land surveying, architecture, BIM, transportation, mines, quarry, and forestry projects thanks to VisionLiDAR. The dynamic 3D fence allows you to select parts of your point cloud thanks to an interior or exterior delimitation. The selection can be saved and used with different tools like editing, deleting, exporting, segmentation, classification, surface analysis, dendrometry, and cylinders and plans detection. It’s also possible to export parts of your point cloud into .E57, .LAS, .LAZ, and .PTS formats. Vectorize complex 3D infrastructures with a few clicks. Roads, tunnels, and other 3D structures can be captured and converted to your CAD with the adaptive 3D and cross section template tool. Multiple alignments can be managed at the same time using different 3D templates. Cross section can be copied to the next station or interval. The user can select single or multiple points or vertex to visualize and adjust the selection to a 3D road, bridge, or tunnel. This tool also helps you create lineworks with feature codes, as well as breaklines for surface exportation into .DXF or Shape File formats. Create images, videos, and fly-throughs in your point cloud. With this tool, you can easily produce an image and save it in .PNG format. Create an intuitive time-based fly-through video in .AVI format in just a few clicks. Extract contour lines, mesh, surfaces, planes, cylinders, trees, sidewalks, buildings, pavement lines, or any other model geometry to efficiently vectorize them. With or without a 3D fence constraint, it can easily be exported into .DXF or Shape file formats, or as a Vision Database. Compare a part of two full LiDAR scans and identify their differences, then export a .PDF report. This function is adapted for building surveillance with its statistical shift tool. Select a region or a part of the Point Cloud using the 3D fence tool and automatically select and measure a tree height, trunk diameter, crown surface and crown diameter, from chest height. You can also choose to apply a constraint on a bare earth surface or not. Segment and filter your Point Cloud using the layer tool. VisionLiDAR can manage up to 128 layers to isolate parts of your scan areas for detailed editing. Rename the layers in compliance with the standards you are using such as DOT or CAD. Also visualize your Point Cloud in RGB, Normal, Scans, Intensity, Class, Wireframe, Color Shading, or Elevation. It helps you simplify your Point Cloud by eliminating irrelevant points without diminishing its accuracy. Use a dynamic registration of Point Clouds tool to control your data and merge your scans using a least squares method. This tool allows you to extract a bare earth surface from your Point Cloud by automatically eliminating and removing vegetation, buildings, cars, humans, and other objects from the resulting mesh surface. It is particularly useful for projects where you need to visualize and analyze the characteristics of a surface. The results of your calculations are much more typical and precise. Extract and draw contour lines from a surface and export them into .DXF format. Calculate volumes using four different methods for maximum precision: inverted prism, grid, cross section and solid for complex vertical and overhang surface. Vectorize complex 3D infrastructures with a few clicks, capture and convert your data to your CAD using the adaptive 3D template tool.. This tool creates cross section templates using feature codes. Multiple alignments can be managed at the same time with different 3D templates. Cross section can be copied to next station or interval. The user can select single or multiple points or vertex to visually adjust the selection to the 3D road, bridge, or tunnel. You can also use it to create lineworks with feature codes, as well as breaklines for surface exportation to .DXF or Shape file. Create a 3D alignment from polylines, line intensity, or points with lines, as well as vertical and horizontal curves. Automatically find the edges of a sidewalk, pavement path, building footprint, powerlines, and export them into connectivity line for break lines exportation. Verify the floor flatness analysis with a selection of your Point Cloud and colorize it into shading zones to represent differences in elevation. Then, export your results into a .PDF report. View and click any point by setting along an alignment or two points, vertically, horizontally, or at any slope angle and dynamically show the cross section in a separate window. Using Potree technology, allow your customer to easily view, measure, and annotate your Point Cloud from a simple Web browser. This intuitive tool allows you to select a surface and display a slope with colorized zones as well as slope intervals. Colorize surfaces like buildings, DTM, or any plan to visualize the deviation of the Point Cloud in different colors. Building scanning is widely used for restoration and as-built. Advances in Artificial Intelligence make VisionLiDAR a software that will save you significant time and money in all your BIM projects. Draw directly on your Point Cloud polylines, curves, and spline, representing windows, doors, or any overhang structure. Create models of buildings in a few steps by easily creating footprints of the building and a simplified roof symbology. Extract edges with the edge detector tool and click on a face of a building to extract all the plans in different colors. Use the surface analysis tool to check the verticality of a wall or the flatness of a floor. In a few clicks, generate an intuitive time-based fly-through video in .AVI format, just like a virtual visit. VisionLiDAR processes large Point Clouds very rapidly to produce a simplified mesh. Select a region or a part of the Point Cloud using the 3D fence tool and automatically select and measure a tree height, trunk diameter, crown surface and crown diameter from chest height. You can also choose to apply a constraint on a bare earth surface or not. VisionLiDAR’s unique algorithm automatically classifies vegetation limited by a 3D fence to separate up to 128 layers and isolate species. Throughout Quebec, experts are raving about LiDAR, a new revolutionary land surveying technology.. LiDAR, also known as Light Detection and Ranging, allows terrestrial, airborne, or mobile scanning, provides detailed digital terrain models, and records landscapes in 3D. Surveys generate data that can be analyzed in software such as VisionLiDAR. SNC Lavalin Stavibel has been using VisionLiDAR since 2016. Before, the Land Surveying department used to survey using an ordinary total station. Now, thanks to the acquisition of a terrestrial LiDAR scanner as well as VisionLiDAR – Geo-Plus’ Point Cloud processing software – they can detect different surface movements and focus on their work in mines as well as other industrial projects. – Locate, measure, and position points, lines, and / or invisible point directly on two or more 3D images by photogrammetry. – Publish your vector data (points, lines, polylines) on maps with ODBC compatible database (Sql Server, PostgreSQL, Oracle). – Easy segmentation of your linear projects with new corridor management tools. Helping to simplify and reduce processing time during extraction. – Automate the extraction of your broken lines. – Annotate perpendicular slope along alignment. – Create dynamic 3d images from point clouds. – DTM extraction from centre line alignment and corridors. – Measuring tools at a glance. – New smart pick points. – Colorize your point cloud directly from 3d spherical images. – Export your vector data to GeoJson, Kml, Mapinfo, Dxf, Csv, LandXML formats. – Intuitive lines plan intersection. – Easy inventory with comments and PDF attachment file over point cloud and 3d image. – Easy intuitive interface with tools tips. – Easy Display point cloud intensity by colour. – New export feature to VisionLidar 365. – Measurements between scan and scan and/or modelled surfaces. 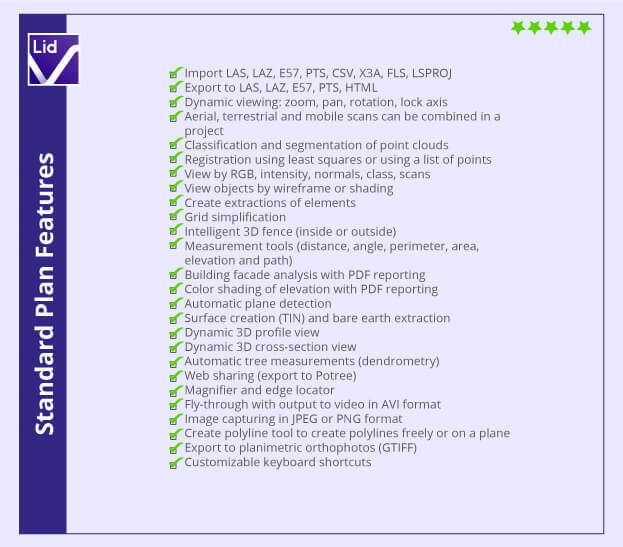 – Compatible with the latest format FLS Faro and Scene (new version). – Scan to BIM in 50% less time with AI detection of walls, floors, windows, openings and doors. – Export your BIM projects BIM IFC to Revit, ArchiCAD without loss. – PDF reporting of tank deformation analysis. – Extend invisible corner of existing contours. – Building Vectorization from slices. – Pole and clash detection. – Extract contours, cross-sections and profiles. – SBET lines display with photos. – GPS time management on point clouds. – Add 3D imagery over your point cloud from (LEICA, Topcom, Teledyne, Faro, Z+F). – Easy adjusting of 3D individual image parameters. – Extract parallel feature lines from the corridor in less time. – AI automatic road object extraction from point clouds and 3D imagery (cars, humans, poles, noises, buildings, traffic signs). – Rail tracks geometry and catenary line detection. – Bare earth automatic extraction. – Corridor DTM surface management. – Intelligent point cloud simplification and de-densification. – Easy registration with control points from other sources such as MLS and TLS. Looking for a tool to calculate complex volumes? Discover our survey software that integrates with your CAD.